Why are we having trouble finding qualified workers in our industry? ► With thousands of "Baby Boomers" reaching retirement age every day, we find ourselves in the bottom of a demographic trough with millions of people potentially leaving the workforce every year. ► Young people are being encouraged to ignore the skilled trades and pursue a college degree instead. ► We are facing competition for skilled workers from other industries such as manufacturing and transportation. ► Many experienced people from our industry are retiring and taking that knowledge with them. These factors have resulted in fewer skilled workers being available and longer times required to locate them and bring them on board to our companies. If you want to be successful in this environment, your recruiting efforts need to become better than everyone else’s, and you need to provide a great place to work so you can become the Employer of Choice. 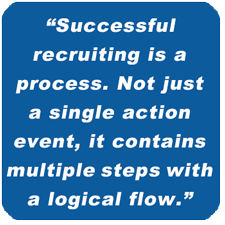 What are the standard practices in recruiting? Building the benefits of working for your company. Having clear job descriptions that outline duties and expectations. Running a profitable company so you can pay competitive wages. Looking outside the industry for candidates. Searching for retail-focused people with good communication skills.Keeping an eye on the future and planting seeds with great prospects. Anticipating short and long-term skilled labor needs. 1. Review and update the job description for the position. 2. Create the employment ad, screening questions, and interview questions. 3. Post job opening to all relevant job boards and social media sites. 5. Do a job fitness assessment on key potential candidates. 6. Conduct an initial interview over the phone. 7. Conduct a first in-person interview. 8. Conduct second in-person interview that includes staff members. 9. Verify past employment and references. 10. Provide written, detailed job offer to candidate. 11. Conduct a drug screen and background check. What are today’s keys to recruiting great candidates? • Paying top wages for each position. • Providing a great benefit package. • Having a fleet of modern, attractive vehicles. • Designing and installing the highest quality heating and cooling systems. 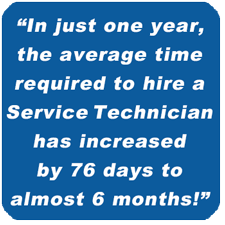 • Having outstanding labor management practices—staying busy year-round. • Developing and maintaining a great company culture and industry reputation. ► Failing to possess a clear, precise understanding of the duties for the position they desire to fill. ► Advertising the job opening incorrectly. Advertising should be nationwide and must mention the pay rate or income potential. ► Neglecting to move candidates through the hiring process quickly enough.The best candidates are not waiting for you to decide on hiring them. They are actively searching for the right job and are in high demand. Waiting “a couple days” can be the difference in acquiring a candidate or losing them to a competitor. ► Developing an emotional attachment to a candidate. Emotional attachment causes hiring managers to overlook the candidate’s shortcomings. Utilize unbiased tools such as personality and skill assessments to filter out candidates before face-to-face interviews. Similar to customers, we want employees to stay with us for a long time. It requires a great deal of time and money to acquire a new employee. The best way to keep them long term is through great communication and a high level of caring. A recent survey by Salary.com revealed that the #1 reason people leave a company is due to a bad relationship with their direct supervisor! ► Setting and communicating a consistent career path. ► Continually and clearly communicating appreciation both visually and verbally. ► Providing smaller, more frequent raises based on predetermined achievements. ► Cultivate a fun, positive work environment: If it’s fun, it will be done. Don’t let a tight labor market slow you down. If you take the time to update your recruiting practices, avoid common hiring mistakes and commit to retaining your new team members, you’ll be better equipped to stay ahead of the competition. Aaron Schuh is a BDR Trainer and President of Recruit4Business. He is a SPHR (Senior Professional in Human Resources) and SHRM-SCP (Senior Certified Professional) in the HR field. Aaron has conducted countless seminars on employee management and recruitment, driving profitable growth for his clients’ businesses.